In our latest roundup of 802.11ac client adapters, D-Link’s DWA-182 didn’t take any first- or second-place finishes, and it finished in third place overall. The adapter measures about 3 inches long, not including its USB interface, but D-Link provides a USB cradle that gives you some flexibility in positioning. D-Link switched to a USB 3.0 interface with hardware revision C1. I had an older version that uses a USB 2.0 interface, but I don’t think it makes a big difference. The adapter itself isn’t hinged, so your only orientation choices are horizontal or vertical. My benchmark numbers came from using the adapter in the cradle. The adapter has a WPS button, which makes it easier to connect the client to the router. The antennas are inside the device. D-Link offers a simple utility for establishing a connection to your wireless router: The utility reports the status of your connection, notes which channel it’s using, and shows a graphical representation of the signal strength. A $50 street price means the D-Link DWA-182 is $20 cheaper than the top-performing Asus USB-AC56, but that also makes it $10 more expensive than the fourth-place Buffalo AirStation WI-U2-866D adapter. 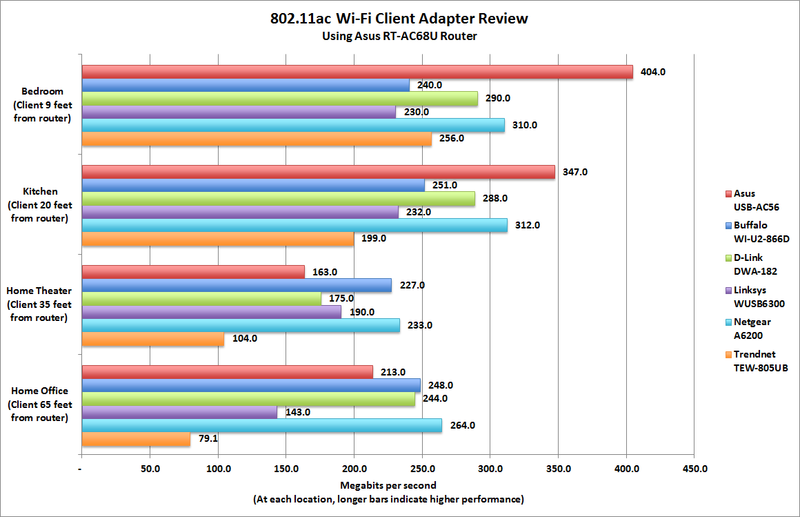 Note: This review is part of a roundup of six 802.11ac Wi-Fi client USB adapters. For more, read the introduction to the roundup. This story, "D-Link DWA-182 review: A solid performer at all distances" was originally published by TechHive.